The goal for the 116 year-old building is to bring more affordable living space to the small town of Belington, said Premier’s Vice President Terri Kittle, and for the Golden Rule to become a vital part of the community life of Belington once again. The hope is that the Golden Rule project will be complete in 3-4 years, with apartments, a retail artist market, museum, and ticket booth for the Durbin & Greenbrier Valley Railroad. A community space with outdoor seating in a former grist mill will be located on the property, she said. 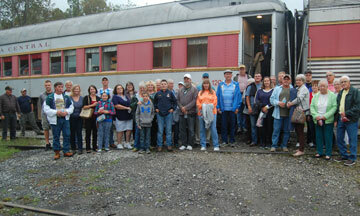 The Open House, which took place on the afternoon of Thursday, October 11th, included a round-trip train ride on the New Tygart River Flyer from Belington station to Tygart Junction near Philippi. Pictured here is part of the large crowd which viewed the interior of the Golden Rule Department Store and the surge of visitors boarding the six O’Clock excursion ride. The Golden Rule, built by the Shinn family, served the area as a grocery store, later a department store, and once housed the Kane & Keyser Hardware Store.